I believe there are limits on police agencies using undercover employees to infiltrate suspected terrorists (e.g., in mosques). May a private person not employed by the police engage in such activity? May such a peson subsequently share his findings with the government? The prompt for my question was a letter to the editor in "The New Yorker" about the Anti-Defamation running a spy ring in the 1930s investigating Nazi organizations in the U.S. I'm not sure if the information could be turned over to the government. I guess the government could not pay for it. These days, I'm sure, a government agency would eagerly take a look at any information thus submitted. It's unlikely they have the budget to pay for any action they themselves did not initiate or instigate but they won't ignore it. In New York City (where I live) the police have been criticized for going undercover to Moslem mosques. If the police authorized or paid for a private organization to do it, I think there would be similar criticism. The point is, they don't need to authorize it. If a private individual decides to do so on his/her own, any information thus obtained can be turned over to the police or the FBI. These organizations would be negligent, indeed, if they made no use of such information. On the other hand, nobody could accuse them of having initiated such an undercover operation. That would be another reason for not remunerating any such private investigator. It would need to be a "labor of love", so to speak. Law enforcement officers and agents regularly infilitrate suspected terrorist groups and criminal organizations. There are limits on what they can do but they can, under certain limited circumstances, engage in conduct that would be unlawful if engaged in by a private person acting without authorization. Such casual racism makes a terrorist strike more, not less, likely. Why don't you try to infiltrate organised crime by hanging around a pizza joint, or drug dealers by hanging out in an inner city basketball court? By lazily assuming all Moslems are terrorists you isolate the vast majority of law abiding Moslems, making it far less likely that they will approach the police if they suspect something. We need to encourage mainstream Moslems to come forward with information, not alienate them. Sending a white guy into a Mosque who appears more interested in blowing people up than in learning about the Koran will just develop a siege mentality. Lot of white guys who are Muslims see the pictures of the Boston bombers as an example of that. This is a major world religion with people of all backgrounds, races and skin colors belonging to it. Next new converts to any religion tend to go more to extremes then people who are raised in that faith. 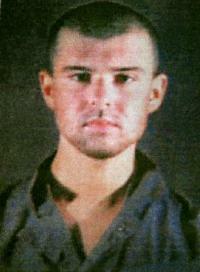 Here is a white guy, John Phillip Walker Lindh, who was raised a Roman Catholic before becoming a Muslim at age 16 and later a terrorist. As always you misunderstand the point. I never said there were no white Moslems. I said you need to stop treating all Moslems as if they are terrorists. I'm not going to waste any more time trying to explain things to you. Maybe Mr. Khan can explain the problems of bigotry towards Moslems. Who said otherwise as the vast majority of Muslims like the vast majority of any group just wish to go about their lives in peace. Still that does not change the fact that some religion centers of that faith have been hot spots for recruiting young men as terrorists and to suggest that it is in some way being bigots to keep eyes on such centers is crazy on it face. There are Christians cults with a similar history of violence mainly over the abortion issue that there is nothing wrong with keeping an eye on. Doing any of the above is not stating that all Christians or all Muslims or all of any group are terrorists. Trying to infiltrate a Mosque as opposed to extremist websites is. In the West, there's far fewer Mosques than Churches. They cater to a far wider demographic. To pick on a Mosque would make mainstream Moslems think you believe they're all terrorists. There was a number of Mosques in the New York area for example where extreme Muslims did use as centers for recruiting and planning terrorists attacks and law enforcement should not now send in agents to keep an eye on such Mosques and their members!!!!!!!!! Using the label of religion should not be a shield to allow terrorists to recruit or plan evil deeds in safety. Be those religion centers Muslims or Christians or any other religions for that matter. Finally if I was a member of the Muslim community I would wish such evil people using my faith as a cover to murder and harm my fellow countrymen to be stop. If Mosques are being used for such purposes you need to replace the Imams, like they did in Finsbury Park. That way the Moslems can police themselves. That's more effective than imposing stuff from the outside. The FBI have got a tip-off line so people can blow the whistle on anybody..
Seen something online that's worried you? If you are unsure whether content is illegal or not, please report it to the police using the link below"
The way to deal with it is to investigate such behaviors no matter if it happening in a club or a church or a Mosques as there should not be any safe harbor for terrorist recruiting or planning. This thread is about an individual going into a Mosque off their own back with no intelligence whatsoever, nothing at all with how the police should behave. Thank you. The FBI page you included doesn't mention a reward, so I guess there is none.